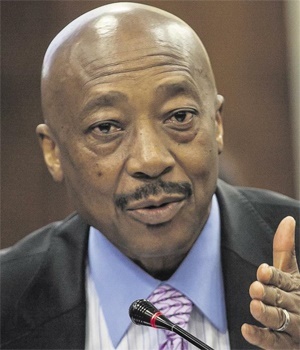 Johannesburg - Suspended SARS head Tom Moyane has threatened legal action over his suspension. In a letter that Moyane wrote to President Cyril Ramaphosa on March 19, he said that his suspension was part of an "unlawful process". The letter, which appears to have been sent before his suspension was communicated to the press late on Monday evening, states that if Ramaphosa were to go ahead and suspend him, he would seek a court interdict. When contacted for comment by Fin24 on Tuesday morning about the possibility of legal action, Moyane said he could not comment. He also did not comment when asked whether he thought his suspension was unfair. In a late-night statement on Monday evening, the Presidency announced that Moyane had been suspended with "immediate effect" pending the institution of disciplinary proceedings. "President Ramaphosa said [the suspension] was in the public interest to restore the credibility of SARS without delay," said Presidency spokesperson Khusela Diko on Monday evening in a statement. "In a letter to Mr Moyane, President Ramaphosa said 'Developments at the SARS under your leadership have resulted in a deterioration in public confidence in the institution and in public finances being compromised. For the sake of the country and the economy, this situation cannot be allowed to continue, or to worsen,'" said Diko. Mark Kingon has in the meantime been appointed to head SARS in an acting capacity. In his two-page letter, which Fin24 has a copy of, Moyane wrote that he was "shocked" to hear that Ramaphosa wanted him to resign or face suspension. "The basis of your decision was solely based on your allegation that I have mishandled the Makwakwa matter and that I took an unreasonable amount of time acting against Mr. Makwakwa,' he wrote. He said that the news that the president wanted him to step down over his handling of Makwakwa came as a surprise, as Parliament "is currently seized with the matter". "...it seems to me that you have developed your view without being in possession of all the necessary documents, such as all the relevant correspondence, investigation reports and outcomes of disciplinary proceedings against Makwakwa." Makwakwa resigned from his position as the tax agency's chief officer for business and individual taxes on March 14, citing "personal reasons". The former top SARS executive is facing a criminal probe by the Hawks related to allegations of corruption, money laundering and racketeering that date from 2016. The criminal probe came about after the Financial Intelligence Centre in 2016 flagged suspicious transactions into Makwakwa's bank account, and that of his partner, Kelly-Ann Elskie. Makwakwa has denied he did anything wrong. The FIC report led to Makwakwa's suspension from the tax agency. But Moyane has been criticised for overseeing his internal disciplinary process, in his capacity as SARS commissioner, which eventually found him not guilty. Makwakwa then returned to SARS in early November 2017, after having been suspended with full pay for about a year. In his letter Moyane wrote that he viewed his suspension as both unlawful and unconstitutional. He said he had been advised that before being suspended, he should have been allowed to state his case "in order for me to dissuade you from taking the decision of suspension or dismissal". "I am advised that your conduct invites urgent legal review and would obviously be overturned by the Courts." He then asked for an undertaking from the president that he would not be suspended, saying that if Ramaphosa went ahead with his suspension he would try to obtain an urgent interdict. As on Tuesday at noon, it was not yet clear whether Moyane had, in fact, approached the courts for an interdict to set aside his suspension.